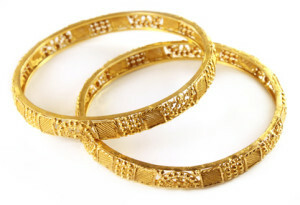 18-karat gold jewelry offers a good balance between durability and purity. Let’s take a look at what this gold alloy is made of and see how you should choose between 18K gold and jewelry of a higher or lower karat number. How Much Gold Does 18-Karat Jewelry Contain? Gold karat is a measure of how much of the precious metal is contained in a piece made with it. If a jewelry item is 18 karats, this simply means that out of a total of 24 parts, 18 parts of the piece are gold, and 6 parts are made up of other metals. Expressed in percentage terms, 18 karats is equal to 75% gold content (18 divided by 24). The other 25% usually consists of metals such as zinc, copper, nickel, etc. The additional metals in 18K gold serve to make the alloy harder and more durable than pure gold (24K), which is too soft for jewelry. Compared with lower karat gold, 18K jewelry has some distinct advantages. For example, since it is purer, it is less likely to cause an allergic reaction in people sensitive to nickel, if this metal is present in the alloy. A 10K gold piece that contains nickel, on the other hand, is more likely to give you a rash if you are allergic to the metal. Another upside to buying 18K gold is that its color is closer to that of pure gold, while the yellow in 10K or 14K jewelry may not be as intense. By the way, buying 10-karat jewelry, which contains 41.7% gold, means that you will be getting a piece that is made up mostly of metals other than gold. The downside of 18K gold is that it is softer and less durable than less pure alloys. For example, a 10K or 14K gold ring will wear down more slowly than an 18K piece, which will scratch and bend more easily. Gold with a karat number higher than 18K is even purer and has a more intense color, but this also comes at a price. 22K gold, for example, is much softer and scratches even more easily than 18K pieces; it is also more expensive. So, think twice before going for higher karats, especially if you will be wearing the jewelry often. Recognizing 18-karat jewelry is pretty straightforward (as long as the piece has been stamped with its karat number). Usually, you will see a stamp on the item such as 18K, 18Kt, 18ct, 18k, or a similar variation. Sometimes, 18K gold will be marked with a number such as 750, 0.75, or a similar stamp denoting that the jewelry contains 75% gold (or 750 parts per thousand). 18K gold is a good choice if you want a piece of jewelry that is reasonably pure but is not overly soft. This alloy, along with 14K gold, is a good compromise between durability and purity. Of course, 14K gold is harder and more durable. However, if you are very sensitive to nickel, even some 14K pieces may give you a rash, whereas 18K gold is much less likely to cause an allergic reaction. It is not a good idea to choose 18K gold for pieces that you will wear every day, especially rings or bracelets, which are more likely to get hit or scratched. In such cases, 14K or 10K gold may be a better choice as it will not bend, break or scratch as easily. Pick 18K gold for jewelry that you will not wear every day or for pieces such as necklaces and earrings, which will be less exposed to inadvertent hits and bumps.